The Impression Obsession team is showcasing new images for summer!! You can visit the I.O. Blog each day this week for links to the previews. 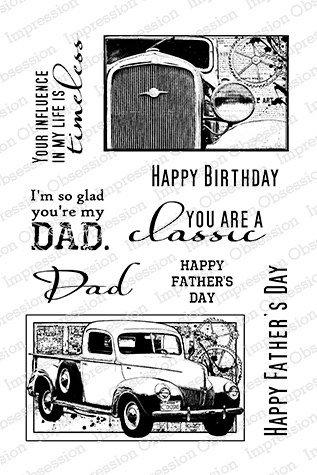 Be sure to leave a comment on each designer's posts throughout the week for a chance to win a $25 gift certificate daily from Impression Obsession! Father's Day is coming up, and I wanted to include a silhouette image to celebrate fathers - this is actually from a photo of my husband with 2 of our kiddos, so it's special to me. To create the shadows, I stamped the image onto a piece of clear plastic with dye ink, misted it, and laid it down on the panel. WOW! I love it! Great card! Awww so sweet. Love the shadow details from the silhouette. WOW, this is really awesome Dina. A wonderful card! Great Father's Day card! I love the black and white contrast! What a precious scene and I love how you did the shadows! Male themed cards seem to be so hard to create but you managed to do this perfectly. I love the image and how simple you've left the card. This is fabulous especially since it has such special significance to you. IO is famous for the silhouette stamps. This is no exception. Love it! What a great card. Love the stamp set. What a fantastic thing to have a silhouette image of your family - you are so lucky to have that, and your card means such a lot to you I am sure. Lovely setting and design. Beautiful card, and what a special stamp! I had to chuckle when you mentioned your dad's memory for car info. My husband amazes me because he's always rattling off the makes and models of cars in TV shows and movies. We watch mostly very old shows and movies and he loves seeing all the older cars. Wonderful new silhouette stamp!! You are so lucky that it is actually an image of your own family!! Such a sweet image and a great card. TFS! Beautiful card, Dina! Thanks for sharing the shadow technique! Beautiful card! Like the shadows created. Indeed you must be proud of your stamp with your family. Bravo. Lovely card by the way. Your card is so clever, I love it. A wonderful card, Dina. I love the subtle texture around the figures, and the very cool shadow effect. Thanks for sharing your clever tip for achieving this! Dina, this card is simply amazing! Love that wonderful silhouette! Great look for a Father's Day card...and sweet to know it is of your family!!! Awesome card! Great card for father day. great masculine card! love the silhouette and the shadow! The silhouette by itself is already wonderfully heart warming, but I really love that shadow effect that you managed! Great card! I love the texture behind the silhouette. Thanks for sharing. As usual, you make it look so easy! What a beautiful. Ard for father! Your silhouette is so awesome! Great card - I love this for Father's Day! The image is gorgeous! Such a sweet image. The shadow is super. I'm going to write down the steps and try this technique.